Explanation: This false-color mosaic of crumbling comet Schwassmann-Wachmann 3 spans about 6 degrees (12 full moons) along the comet's orbit. Recorded on May 4-6 by an infrared camera on board the Spitzer Space Telescope, the picture captures about 45 of the 60 or more alphabetically cataloged large comet fragments. The brightest fragment at the upper right of the track is Fragment C. Bright Fragment B is below and left of center. Looking for clues to how the comet broke up, Spitzer's infrared view also captures the trail of dust left over as the comet deteriorated during previous passes. 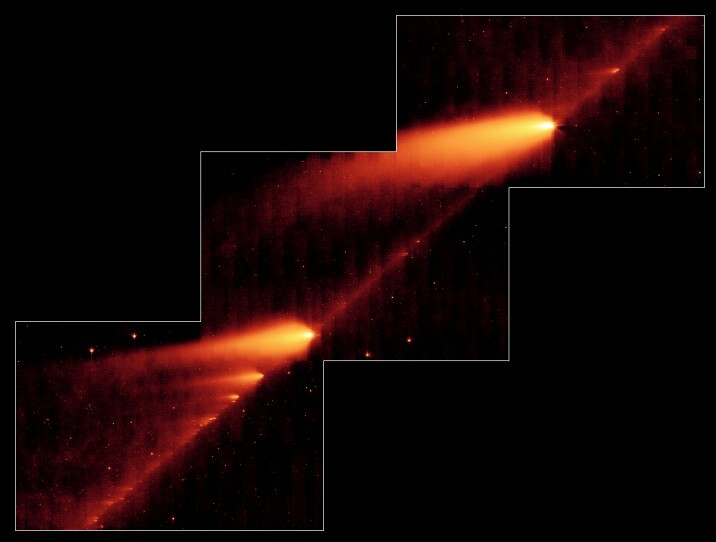 Emission from the dust particles warmed by sunlight appears to fill the space along the cometary orbit. The fragments are near their closest approach in the coming days, about 10 million kilometers away, and none pose any danger to our fair planet.